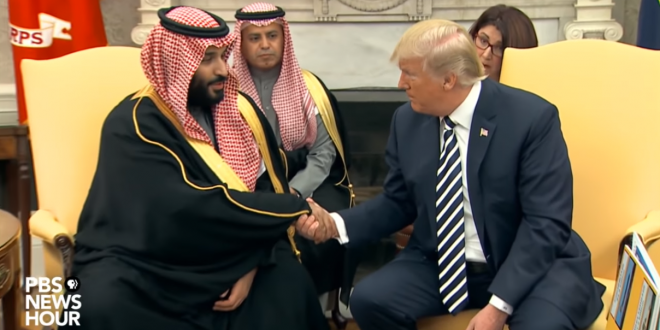 Trump Will Take No Action Against Saudi Crown Prince: "Maybe He Knew About The Murder, Maybe He Didn't!" - Joe.My.God. President Trump declared his unswerving loyalty to Saudi Arabia’s crown prince, Mohammed bin Salman, on Tuesday, declaring that the prince’s culpability in the killing of the journalist, Jamal Khashoggi, might never be known. During his trip to the kingdom last month, U.S. Secretary of State Mike Pompeo reportedly provided Saudi Arabia with a detailed plan on how to make sure Crown Prince Mohammed bin Salman was protected from the fallout over writer Jamal Khashoggi’s murder—and possibly pin the killing on an innocent person. Middle East Eye reports Pompeo delivered the plan during a meeting with Saudi King Salman and and the crown prince last month in Riyadh. America First! The world is a very dangerous place! After my heavily negotiated trip to Saudi Arabia last year, the Kingdom agreed to spend and invest $450 billion in the United States. This is a record amount of money. It will create hundreds of thousands of jobs, tremendous economic development, and much additional wealth for the United States.